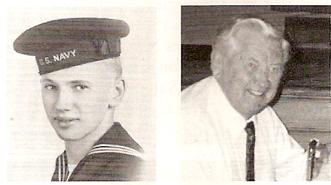 Roger William Anderson, Seaman 1/c, born Oct. 2, 1925, Duluth, MN, graduated high school (Denfeld) and electrical trade school, Duluth Junior College. He joined the USN, F Div., March 9, 1944; trained at Farragut, ID; served aboard the USS Maryland (BB-46); and the USS West Virginia (BB-48). Memorable experience was being present for the Peace Signing Treaty in Tokyo on Sept. 2, 1945. He was discharged April 18, 1946. Awards include the Asiatic-Pacific w/4 stars, WWII Victory Medal, Philippines Liberation w/2 stars and American Area Campaign Medal. He and his wife Mildred live in Costa Mesa, CA. They have three children and two grandchildren. He retired as owner of Anderson-Howard Electric in Orange County, CA. He enjoys fishing and boating.